5FM announces changes to its DJ line-up. The station says that, despite these changes, it will continue to focus its attention on ensuring its music offering is both strong and cutting-edge. The Ultimix Presented by the Weekender5 will continue to take centre-stage weekdays from 18:00 to 19:00 with DJ Loyd and Ryan the DJ on Mondays, Kyle Cassim on Tuesdays, Ms Cosmo on Wednesdays, Das Kapital and Pascal & Pearce on Thursdays and a resident every Friday. Justin Toerien and Stephanie B have held down the fort from Mondays to Thursdays with the Top 10 @ 10, which has been renamed Music Capital where listeners will hear new tracks from around the world. Das Kapital extends his dance and electronic contribution with a second In Das we Trust on Friday and In Das we Trust: Raveyard Edition every Saturday night from 22:00 to 01:00, replacing DJ Loyd’s The Uncut Mixtape. DJ Loyd now presents at a new timeslot on Saturdays and Sundays from 14:00 to 17:00 with the best of hip-hop and house music on Saturdays and a focus on South African trends on Sundays. Weekend Breakfast gets a shake-up as Nicole da Silva takes the reins on 5FM Xtra Loud Weekend Mornings alongside Jude van Wyk on sport and Sibs Matiyela on news. Nadia Romanos moves to the news on The Thabooty Drive alongside Thando Thabethe and Msizi James from Monday to Friday (15:00 to 18:00). Msizi James, The Thabooty Drive co-host, takes over the 5FM Top 40 music show on Saturdays from 10:00 to 14:00 while Vic Naidoo takes control on Sundays from 10:00 to 14:00, with a focus on listener music choices. Saturdays from 17:00 to 19:00 will play host to Ryan the DJ’s 5tarting from 5cratch show, followed by a Saturday edition of The Kyle Cassim Show from 19:00 to 22:00 and In Das we Trust: Raveyard Edition from 22:00 to 01:00. Sunday’s music offering will remain relatively unchanged with Selective Styles with Kid Fonque from 17:00 to 19:00 and Ms Cosmo’s The Stir Up from 19:00 to 22:00. The only change sees Ryan the DJ return for a Sunday edition of his show, 5tarting from 5cratch. For more information, visit www.5fm.co.za. 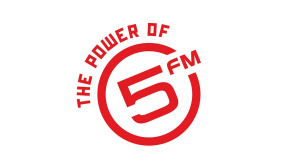 You can also follow 5FM on Facebook or on Twitter.